This is the first time that more detailed, countryspecific water withdrawal data have been integrated into Aqueduct’s global baseline water stress indicator, providing a useful model for other countries and stakeholders wishing to develop baseline water stress indicators in their own countries. While Aqueduct’s global baseline water stress indicators provide useful information on spatial water risk patterns, country-specific data, when available, produce more detailed and geographically specific results. The Aqueduct Water Risk Atlas, developed by the World Resources Institute (WRI), evaluates, maps, and scores water risks globally based on 12 indicators, including baseline water stress. Baseline water stress measures the ratio between total water withdrawal and available renewable surface water supply, and is a good proxy for water risks more broadly. The atlas calculates baseline water stress based on country-level water withdrawal data from the Food and Agriculture Organization of the United Nations, spatially disaggregated by sector into Aqueduct’s catchment areas. Where available, however, more detailed data allow the development of a baseline water stress map for a country or region. In the case of China, water withdrawal data at the prefecture level provide more accurate information, such as spatial patterns, that are otherwise lost in the aggregated country-level statistics. 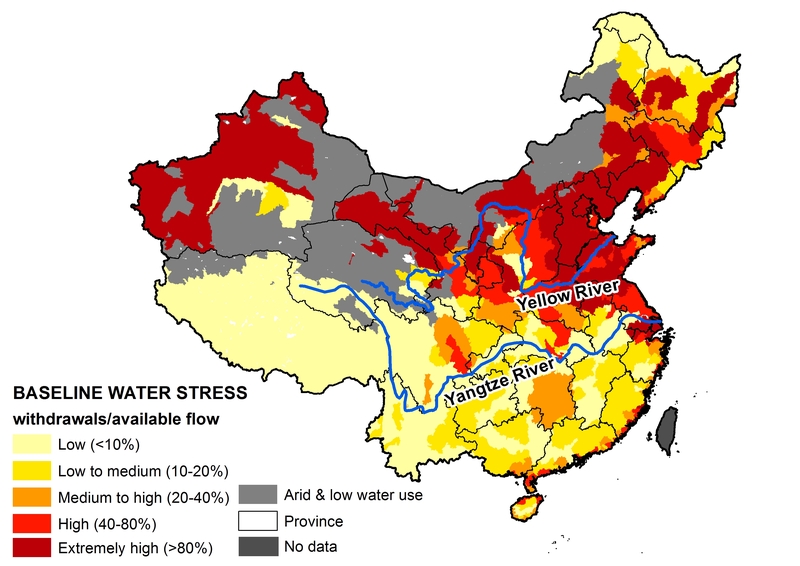 In an effort to respond to the need for more granular baseline water stress maps, WRI has developed a China-specific baseline water stress indicator (BWS-China), using withdrawal data available at the prefecture level for over 300 cities. The data are presented in a mapping tool. This technical note describes the data and methodology used to calculate BWS-China, building on the methodology described in previous Aqueduct publications (Shiklomanov and Rodda 2014; Gassert et al. 2013). In general, results show that Aqueduct’s global baseline water stress indicator maps and BWS-China maps share similar spatial patterns. However, upon closer examination, the maps show differences in some catchments. More detailed water withdrawal data by sector used in BWS-China can reveal new spatial patterns. However, for countries without more detailed data, Aqueduct’s global baseline water stress indicator is still useful for assessing the overall spatial patterns of water risk. The primary audiences for BWS-China are international and national companies with businesses in China, and Chinese government officials. While Aqueduct’s global baseline water stress indicator has been used primarily by companies to assess water risk across geographic boundaries and to develop water strategies on a global scale, BWS-China can meet the needs of companies whose businesses or interests are specific to China. BWS-China can be used by these entities to evaluate investment opportunities or dig deeper into water risks facing their operations and supply chains. BWS-China can also support policymakers and decision-makers at central or local level as they assess water stress in a specific location, compare water stress between locations, and seek to understand the water stress induced by a specific sector. In an effort to respond to the need for more granular baseline water stress maps, WRI has developed a China-specific baseline water stress indicator using withdrawal data available at the prefecture level for over 300 prefectures. This is the first time that more detailed, country-specific water withdrawal data have been integrated into Aqueduct’s global baseline water stress indicator, providing a useful model for other countries and stakeholders wishing to develop baseline water stress indicators in their own countries. The primary audiences for BWS-China are international and national companies with businesses in China, and Chinese government officials.